A 6 step plan for how to plan a month’s worth of meals in about an hour. 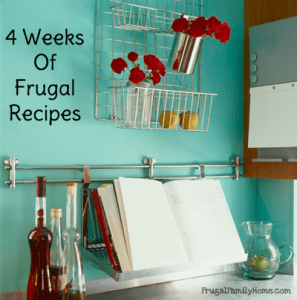 It’s the plan I use to quickly plan a month’s worth of meals at our house and I hope it can help you too. How many times has dinner time rolled around and you go to the cupboard to see what you’ll make? As you search your refrigerator and cupboards you see lots of ingredients but it’s hard to put them together into a meal. The kids are whining, they want to know when dinner will be ready. Your hubby arrives home and is hungry too. You have a choice, throw something together or grab something out. Out of frustration, you grab a frozen meal out of the freezer you purchased just in case. Or you head out the door to grab something to eat to get everyone fed after a long day. You know there has to be a better way to get your family fed. 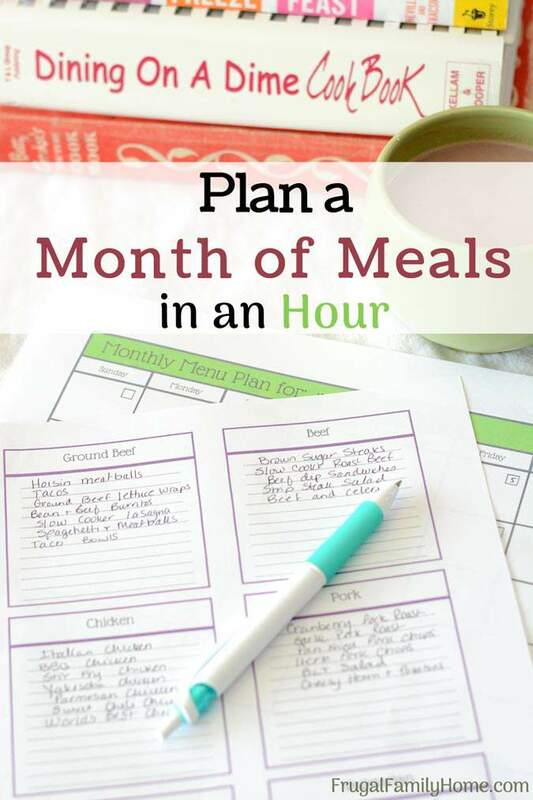 Or maybe you do meal plan but it’s hard to get meals planned each week. Sometimes you forget to put your meal plan together. Or you just don’t have the time to meal plan each week. I understand. In the past, I would meal plan each week, but sometimes I wouldn’t get it done and then we would end up eating out because I didn’t know what to make for dinner. That’s why I switched to planning my meals by the month instead of by the week. In this week’s, podcast I’m sharing my system for how to plan a month’s worth of meal in about an hour. The first few times you give this type of meal planning a try, it may take you a little longer. But once you get everything organized, your meal planning time will short and only once a month too. Grab a calendar or print a month on one-page sheet. This will be where you are going to plan your dinners of the month. I only put dinners on here. Make a list of your favorite dinners. I use one of my printable sheets with section heading for each type of meat. One section for beef, one from ground beef, chicken, vegetarian meals, pork, and fish. On the back of the favorite meals sheet, I add a list of a few meals about 5 that we love to have each month. Pizza is a very popular meal at our house so I make sure to put it on our meal plan at least twice a month. Add your absolute favorite meals to your calendar that are on the back of the page. I’ll add them to our meal plan at least once or twice during the month. I like to add our must have meals first so I don’t forget to add them. Search your pantry and freezer. See what you have stocked up and make a list. Try to coordinate what you have on hand with meals on your favorites sheet. Make your meal plan. Add the meals to your monthly meal plan sheet. I like to make sure to keep our protein sources spread out over the month. Nobody at our house wants to each chicken, even if it’s a different kind for 5-6 days in a row. I’m sure that’s true for your family too. 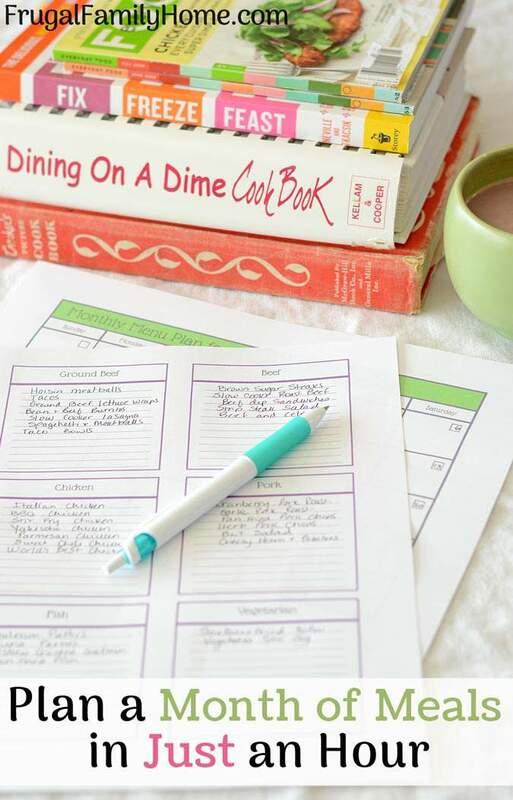 The homemaking planner has all the sheets you need to plan a week or a month’s worth of meals. Plus lots of other helpful sheets to keep your day organized one page at a time. I like to make a favorite meals list for each season of the year. We have a different list of favorite meals for summer, winter, spring and fall. Using these 4 different lists helps us to keep our meals varied and we stay out of the same dinner rut. I’m always on the lookout for new recipes on Pinterest and Facebook. When I find one I’ll print the recipe or save it to my dinners Pinterest board. I try to add at least one new meal a month and sometimes up to 5 new meals to our monthly meal plan. It’s easy to do when you save them as you see them while surfing the web or social media. Having a stock of new recipes to try can help you vary your meal plan easily and you may find a new favorite meal to add to your list. That’s my tips for how to plan a month’s worth of meal in about an hour. I hope they were helpful for you and will help you get started meal planning or help you meal plan less often. 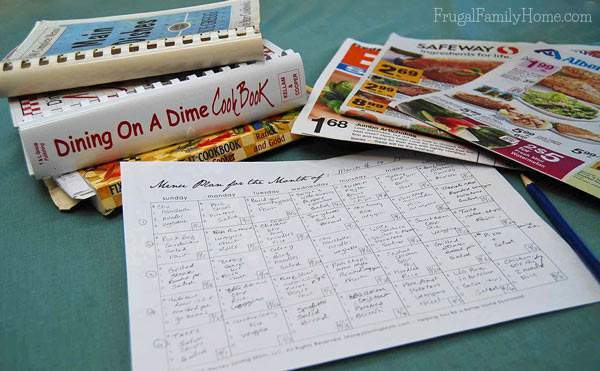 What’s your favorite way to plan your meals, by the week, the day of, or a month at a time? I’ve been searching meal planning ideas and this is the first one that makes complete sense to me! Thanks so much for posting! Your welcome Amber, I’m glad you found it helpful. Thank you for sharing your system. It has been very helpful to me. We are just moving back into our home after a house fire (no one was hurt, praise God) but, we have a new kitchen and am trying to get back on track with meal planning. This took me 3 days to put together since I work full time but, I am excited to get back in my new kitchen and cook again!! Melanie, sorry to hear about the house fire, thank God no one was hurt. Yeah for getting back into the kitchen and cooking again. 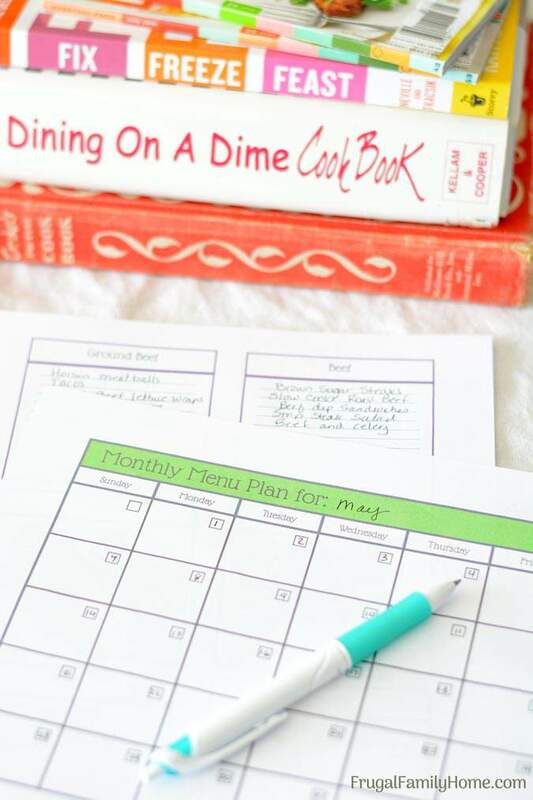 The process of month long meal planner is sure to get quicker the more you use it. I hope you enjoy cooking in your new kitchen. I’ve done something like this for about 15 years now. I assigned each day of the week a main dish: Monday- chicken, Tuesday- ground beef, etc. Then chose our 5 favorite recipes & plugged them into the calendar. Next I added side dishes & dessert ideas. But I realized that if I simply repeated the month’s menu each month ( with a few changes due to seasons- chili in winter or strawberry shortcake in summer) that what I had was a YEAR’S menu plan! There’s no boredom because you only eat each recipe 12 times a year. New recipes are easy to add by just pulling that old standby & plugging in the new one. Glad to hear you have a meal planning system that works so well for you. It’s nice when you find something that works so well and makes getting dinner done easier. Does anyone have ideas on how to pare this down for a single person? I really want to have things planned out, but don’t want to end up eating the same things or overflowing my freezer with leftovers. I came from a large family and can’t seem to get the hang of cooking for one and planning ahead. Kim, You could try planning to cook recipes you love and if the recipe is for 4 people cut the recipe in half so you only prepare half the recipe and end up with 2 serving. Then you could eat the extra serving it for lunch the next day. That would keep your freezer from being packed with leftovers and you could make a bigger variety of foods each month. I hope this helps Kim. I select one from list 1. OR one from each 2-4 for each dinner plan and one from 5. & 6. for breakfast and lunch per day. Sometimes a meal plan works so well, I save the whole menu on a new list titled “Dinner Meals.” Everything is in a binder. That sounds like a great system, Shelia. Thanks for sharing it. Thank you so much for sharing this. I am a working mum with two toddlers. This is really shedding some light ! I’ve done the ‘favorite meals’ list way for years, too. This was a helpful read. I keep a master list of meals by the month, that includes a list of which page the recipe can be found in which cookbook or a link to the recipe if it is available online. For each month I consider what produce is fresh locally and what tends to be on sale (example: March is frozen foods month). At the beginning of the month, I plug the recipes into the calendar. This year, instead of doing this on paper, I’ve been doing this on Google Calendar so I can see what our family has going on certain days. Usually I plan Italian for Mondays, Leftovers for Tuesday (the day everyone in the family seems to have classes/meetings), meatless or seafood for Wednesdays, Asian or Mexican for Thursdays, etc. My only issue now that I have this in an electronic format, is that I’d like to be able to take my month of recipes from one year and automatically transfer it to the same month the following year, hopefully making my menus for holidays transfer to the correct day. I have yet to figure that out, but welcome any thoughts you have about it. Brenda, it sounds like you have a great system for your meals. I’m not sure about how to automatically transfer the pervious month to the new year and have it come out correctly since holiday like Thanksgiving and Easter move around. Sorry I couldn’t be of more help with that. If I find something I’ll let you know. 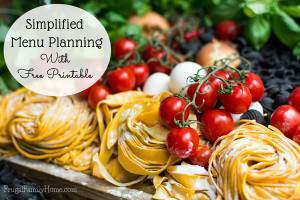 Thanks for sharing about your meal planning system.